Deeping Swimming Club enjoyed a fine result. Deepings Swimming Club enjoyed a fantastic result in the final round of the Junior Fenland League last weekend at the Regional Pool in Peterborough. The squad won 13 of the 45 races, amassing 160 points, to win by four points from home team City of Peterborough B. Leading the way with two wins was Zack Treharne. Swimming in a higher age group (under 13), Zack won the 50m backstroke and the 4x25m individual medley. He also took two second places in the 50m breaststroke in the u12 and u13 events. 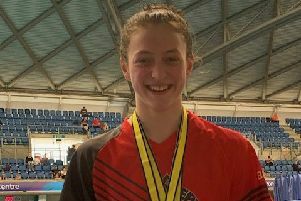 Matching his achievements were Louis Sanderson (50m freestyle and 50m backstroke), Jacob Briers (50m breaststroke and 25m butterfly), Freya Smith (50m breaststroke and 50m butterfly) and Emma Dennis (50m breaststroke and 25m butterfly). Also taking maximum points were Molly Briers in the 50m butterfly, Sian Morgan-Plowright in the 50m freestyle and the 8x25m mixed relay team of Emerys Connelly, Raymond Sheridan, Lukey Harriss, Owen Sadler, Lilly Tappern, Lara Treharne, Robyn Gerrard and Sian Morgan-Plowright.